At times, the culture gap and the differences in traditions and mentality between an average European and a Japanese person seem so striking, that any attempts to bridge this gap seem pointless. A person from Poland who is not specifically familiar with Japanese culture and traditions is usually not able to spot any shared elements which are present in the culture and lifestyle of these two countries, so remote in geographical sense, as well as from the point of view of the respective mentalities. However, in December two institutions took on this challenge: the Warsaw’s In Situ Foundation and KCUA in Kyoto. Together they decided to launch a project entitled “An Approach to Being”. The aim of the project was to present certain phenomena inherent in the Polish art of the second half of the 20th century and some of the works from the beginning of the 21st century. It is worth mentioning that the project did not serve as a vehicle to present a retrospective overview of the work of Polish artists, but rather to provide curators’ commentary or, in other words, to find a universal message and form in which Polish art of this period could be presented so that it would be easily understandable for the people in Japan. Therefore, the works of fifteen artists were collected. All of them, even at first sight, are characterized by simple form, minimalism and openness to various interpretations. In spite of that, when you take a closer look at these works and adopt the approach suggested in the title of the project, you will notice that, in various ways, all of the artists tried to address existential issues and the differences between various forms of being. What does “being” actually mean? How to understand this specific notion? Looking at philosophers’ deliberations, being is constituted by something that “is there”. It is everything that exists. It can encompass the forms that belong to the physical world, as well as immaterial entities. Contemporary world presents us with an enormous amount of immaterial and virtual forms of existence. Therefore, the question of “being” becomes especially crucial nowadays, as it ceases to belong to theoretical discussions and becomes much more practical. Despite the fact that some forms of existence do not assume tangible form, they directly – noticeably and provably – influence our reality. Taking the present times into account, we could ask how the notion of being is perceived in the 21st century. Maybe we should revise our way of understanding of this notion, just as we need to change the relationships between different countries and cultures? The artists whose works were presented during the project look for a symbol, which would describe their existence and leave a permanent, inimitable mark. In fact, their art and the issues portrayed in their works are constantly vital and universal, despite the specific context in which the works were created and the historical and political circumstances, which the artists had to deal with while creating their own space for artistic activities. One of the best examples illustrating the statement about universality is the attitude and artistic activity of one of the artists invited to participate in the project – the Japanese man who moved to Poland in the late 50’s. 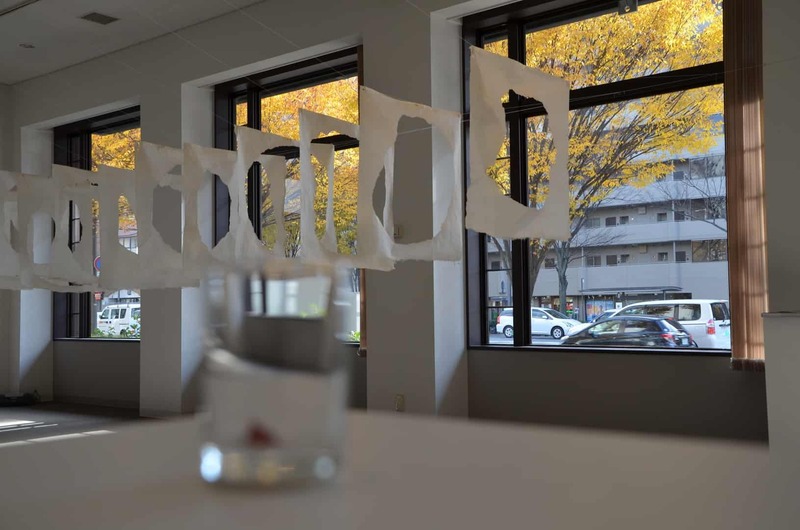 Through his artistic work, Koji Kamoji attempts to record artefacts and phenomena, which we usually forget about or wave aside, because they constitute elements of our everyday life. They are the basic building blocks that form our reality – water, the air, the sky and soil. Kamoji tries to capture their passing and elusive nature. He strives to highlight their existence and our fleeting presence in this world. 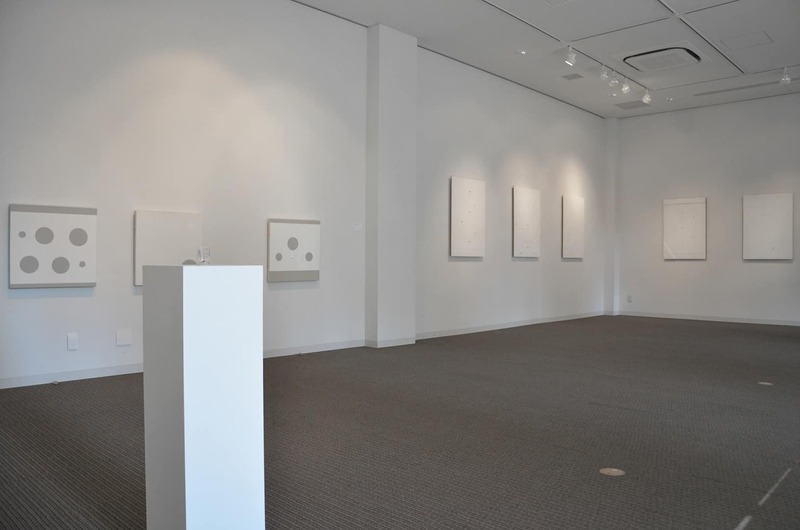 Upon entering the exhibition hall, the spectator immediately paid attention to the row of white objects – “paintings”, each one with the “hole” in the middle. They presented emptiness. The missing middle part in each of the objects in the installation multiplied emptiness, which emphasized the lack of something that used to constitute an integral part of the objects. 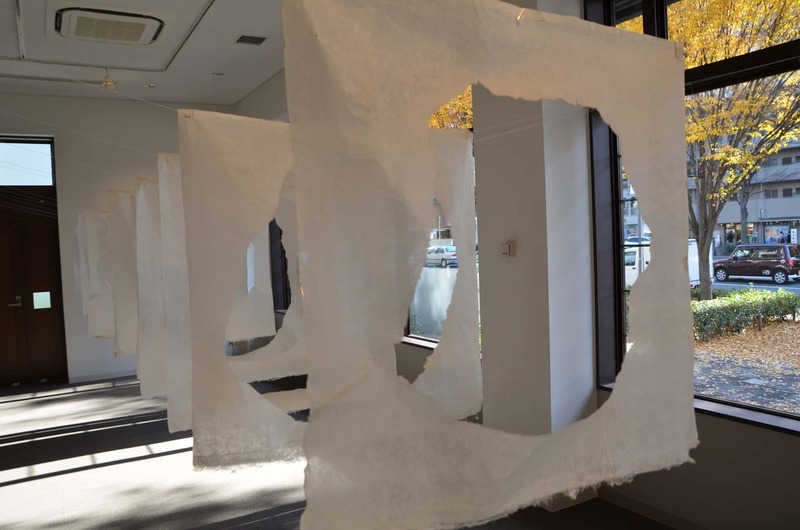 In all Koji’s works one can notice his willingness to expose the hidden and imperceptible. It is also visible in his earlier work entitled “Still life”, created in 2003. 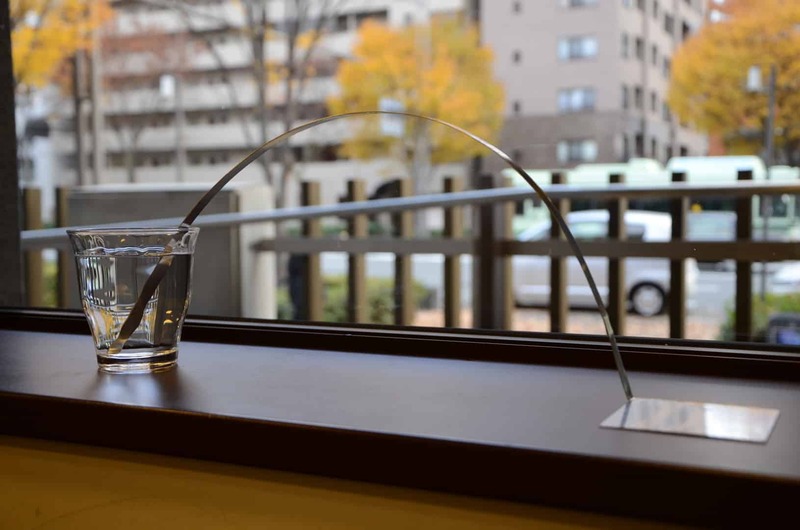 The object placed on the windowsill in KCUA (similar installation was presented during the exhibition in Foksal Gallery in Warsaw) consisted of a flat piece of metal attached to a windowsill with a thin metal arch coming out and having its end attached to a glass full of water. 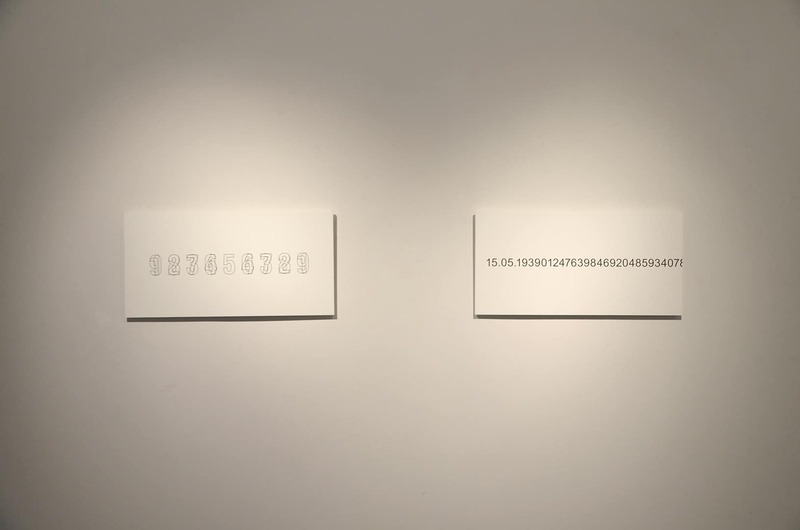 During the exhibition in Warsaw, the artist explained the meaning of his work. The piece of metal and the metal arch created an instrument that transmitted the sounds of these artefacts, which we consider dumb and inaudible and which, in fact, constantly speak with their own voices. We live in constant haste in our own superficial world, which is why we simply do not notice these objects and are not able to hear them. The work described above is connected with the project of Edward Krasiński (who used to cooperate with Koji Kamoji and is one of the founders of Foksal Gallery) through its formal aspects as well as presented content. 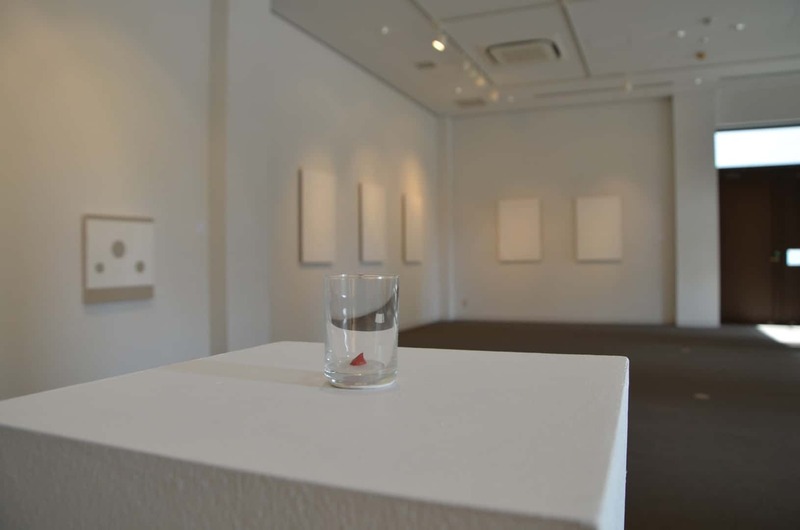 During the Kyoto exhibition a small work by Edward Krasiński was presented. In fact, this work had rarely been exhibited before. However, it perfectly conveys the essence of the artist’s Dadaist and grotesque manner of creating works of art. The presented work consisted of a glass with a red spot inside it, created by dried paint. In this humorous way, the artist managed to record the creative gesture. A drop of paint is in fact the most basic sign of ongoing artistic activity that can be imagined. In this case, the drop had been caught and closed in imaginary glass jail to be watched by members of a few following generations. While creating the exhibition, one of the most iconic motives of Krasiński’s artistic work could not have been omitted. The motive is a blue line surrounding space, called blue scotch. Blue scotch created a “spiritual circle”, which highlighted the surrounded space and made it more realistic. 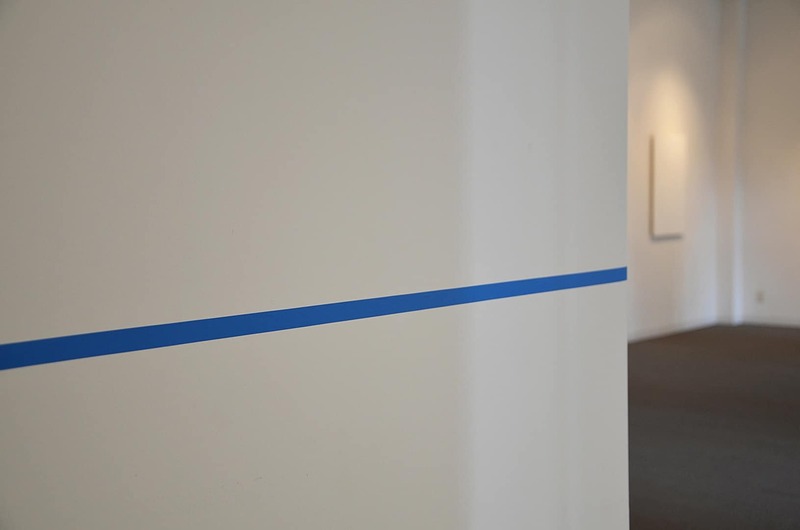 In this way, the surrounding walls and the space enclosed by the blue line became integral parts of the installation. The used symbolism caused the human reality and inanimate forms of being to gain more material, tangible dimension. Same with Bożena Biskupska’s works. Her delicate and organic forms, which, at first sight, look like some abstract spots, were supposed to depict changes in her works which occurred as time passed. Damp patches and paint streaks mark these changes. 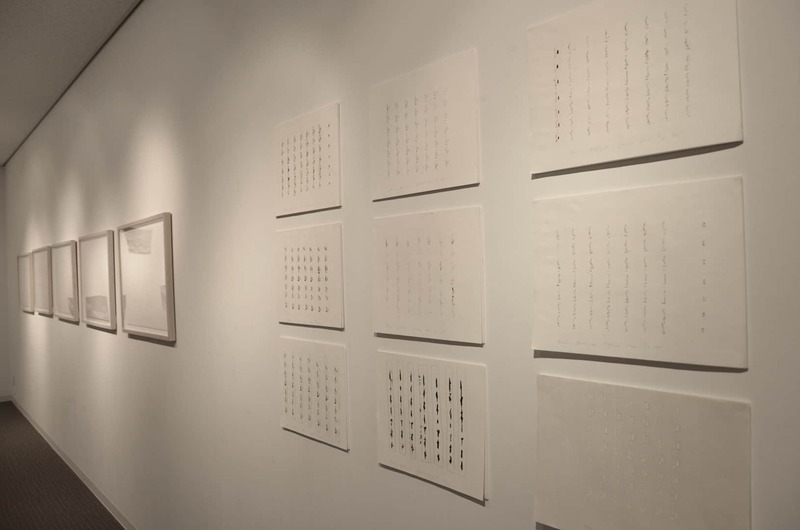 In the exhibition, the photographs by Zygmunt Rytka from the series entitled “Continuous Infinity”, “Impermanent Object” and “Temporary Objects” were also presented. 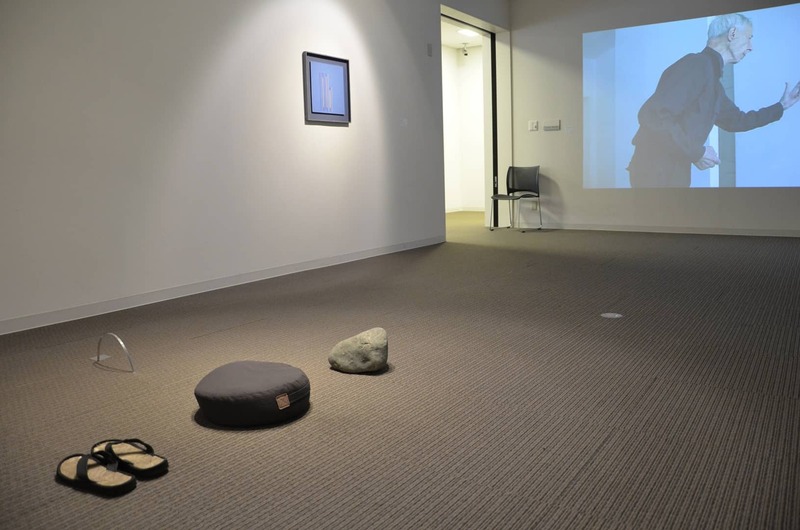 The majority of his exhibited works emphasize the juxtaposition of a human being/the body of an artist with inanimate matter – water, rocks and the air. For Rytka, stones symbolize eternity and permanence of nature and the nature’s dominance over human destiny. In the 80’s and 90’s, when the exhibited photographs were taken, the artist contemplated the existence of a higher order in nature and our “helplessness in the face of infinite existence”. He tried to find his place in this world by means of comparing and contrasting himself with the element of water and stones, which seemingly are the most durable forms. In the photos presented in Kyoto we can see him going deep into a stream and, in this way, showing resistance to nature, just as the stones he held in his hands usually do. Some other time, he juxtaposed these stones and his frail body. For a while he became their master and tamer. In this specific moment, the destiny of this particular human being and the stones combined, they influenced each other for a few seconds. Stones as a symbol of being/existence constitute one of the frequently used motives in the artistic activity of Koji Kamoji, the artist mentioned earlier in the text. In KCUA, on the floor next to flip-flops and a small pouf there was a fieldstone. “Stones are part of nature and, simultaneously, they act as deposits of memories, witnesses of ongoing events and fossilized feelings” – said Kamoji. So, a stone is a dumb witness of the presence of a missing person, whose voice is symbolically recorded through a metal plate placed opposite an empty seat… An empty, waiting seat… A seat which bears witness to being… but whose being? I also would like to mention the works by Norman Leto, who uses computer software to create new realities in the virtual space. He creates new forms of existence and spaces on the basis of gathered materials and photos of the real people and places. Their presence and existence in the parallel “matrix” world (on another level, where a human plays God – the creator) have been captured thanks to mathematic calculations performed by multiple computer programs, which processed data supplied by the artist. Then, the evidence of existence of these people and places, i.e. their representation, has been translated into the well-known visual language and recorded in digital prints or in computer simulation. The latter way of presenting the existence was demonstrated during the Kyoto exhibition. Norman Leto himself claims that he is “not interested in mimicking the so-called reality, but rather in creating something more ‘somewhere else’, even if its existence is just virtual […]”. Unlike other artists, Norman Leto does not challenge the reality surrounding him, but rather he creates new forms of existence and relations between them as well as new space, just as the demiurge does. “This show tries to make an Eastern European annex to the well-known history of sound in art.”- Contemporary Lynx had the pleasure to talk to David Crowley and Daniel Muzyczuk – the curators of the show Sounding The Body Electric: Experiments in Art and Music in Eastern Europe 1957–1984.